Finally… I got to take a picture of the street art on the west side of the shipping container which serves as a temporary public toilet on Brighton beach front, opposite the Fortune of War pub. (see my earlier post in Street Art for photos of the other sides). I like this spray painting because of its painterly style – composition, form, use of colour complements), but also because of the pun and the ensuing narrative. The artists ‘tag’ name is Req, the image is of a wrecked ship, washed up in front Brunswick square in Brighton, by the looks of it. Once it roamed the oceans and now lies beached, monumental and rusty, admired by a solitary onlooker. So we are taken on a little journey in which we may ponder whether the painting is an allegory for (the artist’s?) life. Also now consider the art is painted on the side of shipping container, now lying on the beach, being used as a toilet, and we start wondering where that shipping container might have travelled, and all the other uses it might be put to. The photo is maybe not true to life as it was taken at night. 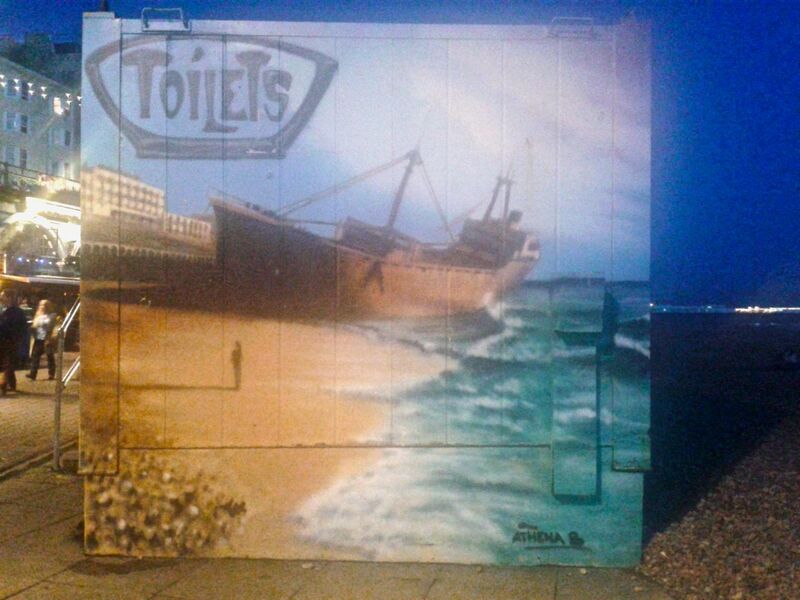 This entry was posted on November 14, 2014 by braveadmin in Brighton, News Views, Street Art and tagged art, brighton, container, fortune of war, painting, pub, Req, seafront, shipping, spray painting, street art, toilet, wreck, wreckage.